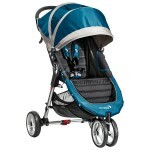 The Baby Jogger City Mini is an extremely practical, easy to use pushchair. 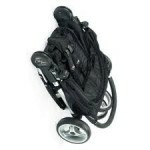 The one handed fold is genius and makes it easy to fold and unfold the pushchair with a child tucked under one arm. The flat fold slides into small gaps. 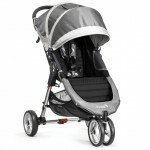 Packed full of features like a large hood, good shopping basket, storage pocket and large lie flat area. The City Mini fits a carrycot and car seat. I cannot sing the praises of this brilliant practical pushchair enough. Highly recommended. One handed fold. Neat and slim when folded. Light and easy to carry. Huge canopy with peekaboo windows - offers good sun protection and protection in a light rain shower. Lie flat toggle recline. 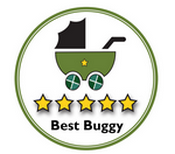 Fits a carrycot or car seat making a great travel system from birth onwards. Good sized shopping basket. Large, tall seat. Stylish. Very easy to use. May tip if you push one handed - there is a new four wheel version which resolves this. Non adjustable handle. Raincover not included. 8 inch hard plastic EVA tyres with sealed ball bearings. Quick release. 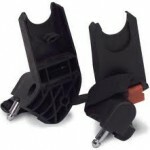 Front lockable swivel wheel. Lots of optional accessories including car seat adaptors, a choice of 3 carrycots (hard bodied, compact or compact plus (2012)), belly bar, changing bag, cup holder, carry bag, raincover and glider board. 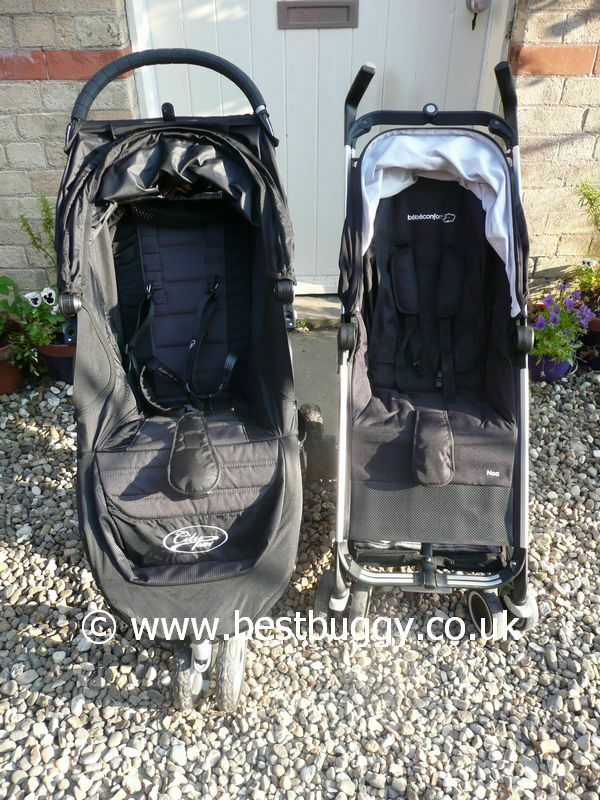 The carrycots can be added onto the chassis with or without the pushchair fabric. Removing the fabric makes the City Mini more like a pram. There is a four wheel version of the City Mini. 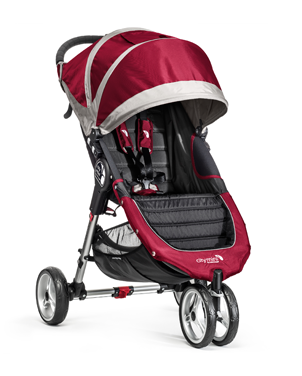 The Baby Jogger City Mini GT has some of the additional features of the City Elite, with a larger seat than the City Mini, but less bulky and heavy than the Elite.